(Newser) – Prepare to hear the name Xi Jinping for years to come as a main player on the world stage. 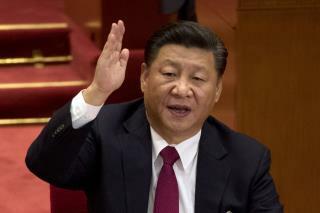 China's Communist Party on Tuesday made a rare constitutional move that elevates Xi to the status of Mao Zedong and sets the stage for him to rule indefinitely. Specifically, the party enshrined Xi's ideology, dubbed "Xi Jinping Thought on Socialism with Chinese Characteristics in a New Era," into the constitution, meaning it will be taught in schools from now on, reports the Guardian. He is only the third Chinese leader to receive the honor, after Mao and Deng Xioping, notes the Washington Post. Technically, Xi is only formally beginning his second five-year term as party secretary, but the move and the accolades he has received all week seemingly guarantee his long-term status. Sorry, Trump is not Mao, and, no we don't. Mao has a lot in common with trump ..both are demagogues who F up everything they touch....... yet their followers treat them like living gods. People scream Nazi and Hitler. But Hitler and the Nazis can't hold a candle to Mao and the dark police.